The new Crew Exploration Vehicle would be tested by 2008 and conduct its first manned mission no later than 2014, the White House has said. 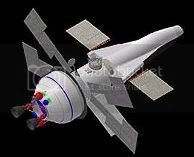 But NASA chief Michael Griffin has indicated that he would like a new spaceship ready much earlier. Bush also outlined an ambitious plan to take astronauts back to the Moon as early as 2015 and eventually to Mars. The current fleet - Discovery, Atlantis and Endeavour - is currently limited to missions on the ISS. NASA's space shuttles were put in service in 1981. The Columbia's destruction and the Challenger tragedy in 1986, in which seven other astronauts were killed, has left the agency with three spaceships. The expensive human mission to Mars would launch after 2020, but the Moon mission could be financed through NASA's regular budget, according to a NASA document. The funds for new US objectives would become available with money saved from the shuttle fleet's retirement and a reduction in ISS contributions. Onward to the next Generation of space craft.